I hope you enjoy my tips on how to read greens. 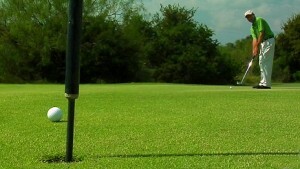 There is a certain amount of anxiety for many golfers when they get on the putting surface. Unfortunately most of them don’t practice their putting and the ones that do are focusing on the wrong thing. Most of my students are concerned with the actual putting stroke rather than the actual putt itself. I’m sorry, but you can have a putting stroke like Steve Stricker or Ben Crenshaw and still live at the corner of three putt lane and I quit the game boulevard. The putting process has a few more steps that just the stroke itself. Too much emphasis is being placed on the putting stroke because our PGA Tour buddies always get caught on tape working on it. Well guess what folks? They are experts at the other steps in the putting process. It occurred to me that most golfers skipped the class on how to read greens and went straight to how to hit a driver at mach seven. Now I can go on for days and write several dissertations on how to stroke the ball properly but you nice people have things to do. I’ve decided to give you a rundown on how I read greens, pick an aim point, and line up the putt properly. The first step is arguably the most important step because without a semi accurate read of the putt there is little chance of it going in or even near the hole. Reading your putt starts a few paces before you step foot on the green itself. When I arrive to the green I immediately take note of where the high and low spots are located on the green. I do this because it gives me an idea of where the green was designed to drain off water. Gravity will take water and your golf ball to the path of least resistance. After assessing the green, I will take a look around the hole and decide which side of the hole is higher than the other to determine which way the ball will fall or break. Next I determine the high and low sides between my ball and the hole. Is the hole above, below, or level with my ball? This will affect the speed of the putt which in turn will affect the aiming point. When choosing a proper aiming point I try to determine a spot on the high side of the hole. Remember, gravity is constantly working to take the ball to the lower side. So the more severe the slope, the further you’re aiming point should be from the hole. For example, let’s say the hole is above your ball and the slope of the putt breaks to the right. Our aiming point should be past the hole and to the left. This will allow gravity to pull the ball back towards the hole as it rolls. On uphill putts, gravity is pulling the ball so your aiming point should be past the hole as the putt will need more pace to fight off gravity. Likewise on downhill putts, gravity is pulling just as hard so your aiming point should be short of the hole as the putt will gain pace down the hill . Keep in mind the faster the putt, the lesser it breaks, and the slower the putt, the more it breaks. Now that we have selected an aiming point it’s time to get this party started. All golf balls these days have their name in a relatively straight line on the ball. I often color a line over that name to help me line up my putts. Take that line and aim it at your aim point. Guess what? The hard part is over. Most putters these days come with a line or some sort of alignment aid on top. Use that line on your putter and line it up with the line on your ball. By extension, your putter is now lined up with your aiming point. Time to rock and roll. The anxiety most golfers feel on the putting greens stems from their inability to read greens and properly pick an aiming point. To the cure that anxiety, I recommend going to a putting green with one ball and simply going through this process on each putt. This will train your mind and better prepare you for playing situations. Once you’re out there playing, trust the line you read. When you step up to putt the only thing on your mind should be speed. The read has already happened. No more anxiety. No more confusion. More putts made. We hope you find this tip on how to read greens helpful. 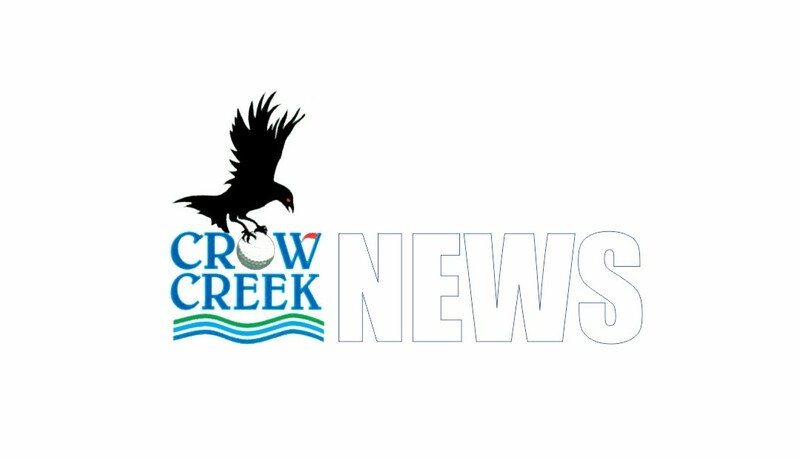 Ask our pros about Crow Creek golf instruction, or click HERE for more information.